Samuel Peploe is typical of the many British artists who succumbed to the magnetism of Cezanne in the early part of the twentieth century. 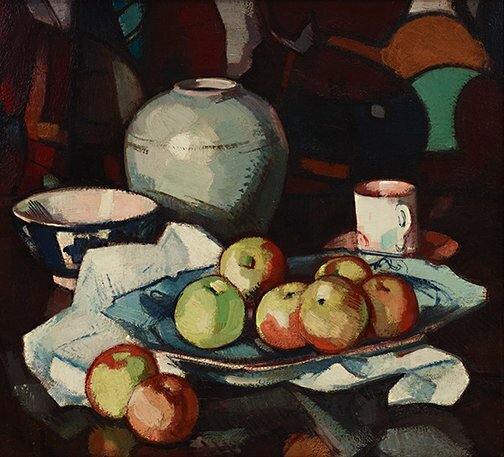 One of the so-called Scottish colourists, a loosely allied quartet of post-impressionist painters, he made a decisive visit to France before the war, during which time this well-constructed still life was completed. Generous in its dispersal of pigment, it is nonetheless an example of modernist 'belle maniere' - refined and beautiful painting. The surface appearance of this work derives from a system of square-brushing that links Peploe, via Cezanne, back to artists of the nineteenth-century Glasgow School like John Lavery. Naturally, Peploe saw himself as a modern, but he was also a patriot for whom national sentiments had their place in art. In the 1920s he and his closest colleague, Francis Cadell, painted views of the Scottish regions which they dubbed 'Ionascapes'. Renée Free, AGNSW Collections , 'The Western Heritage, Renaissance to Twentieth Century', pg. 108-172, Sydney, 1994, 156 (colour illus.). Modern Britain 1900-1960 , Melbourne, 2007, 29 (colour illus.). Art Gallery of New South Wales catalogue of British paintings , Sydney, 1987, 149 (illus. ).